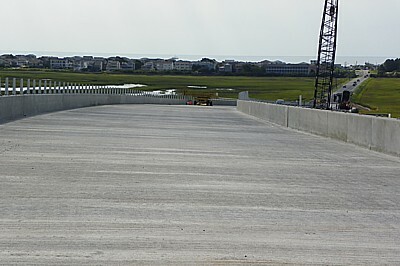 End of new bridge on the island side. The bridge itself ends where the upper railing ends on the right near the crane. 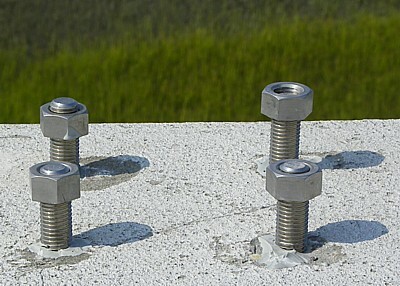 Bolts on left are for metal braces such as the ones on the right to which guard rails will be attached. 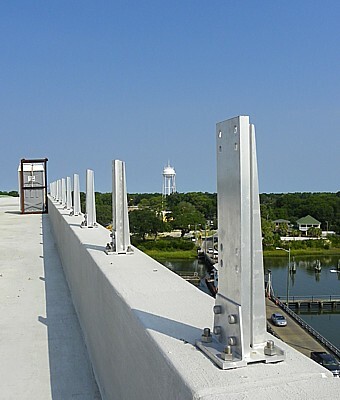 One of many splits on decking of bridge allowing for contraction and expansion during cold and heat. 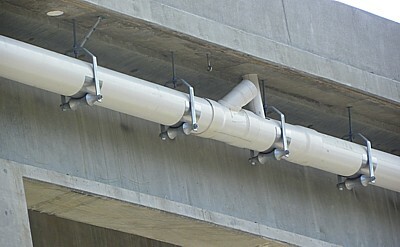 Each side of the split has an elasomeric concrete. The material is not prone to flaking or cracking. 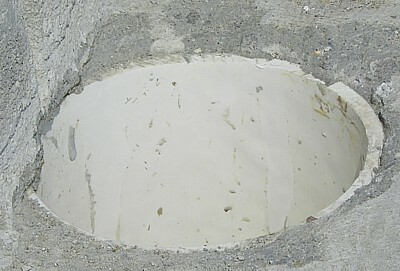 A evazote joint material will be glued in the opening to make it water tight. 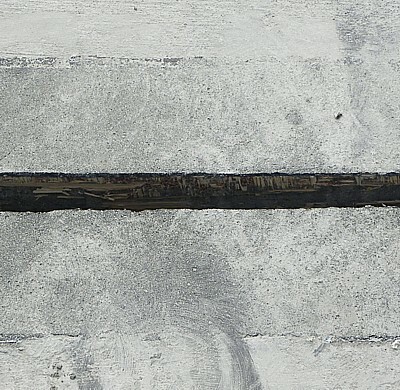 Drains are evenly spaced the length of the bridge deck at its west edge. Stormwater run-off passing through each of them will enter a wide collection pipe under the bridge and then flow into the nearest infiltration basin. 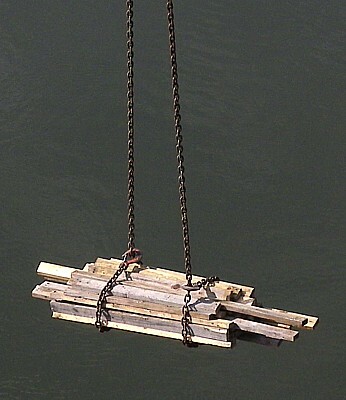 The pile of lumber being lifted upward and over to a truck. 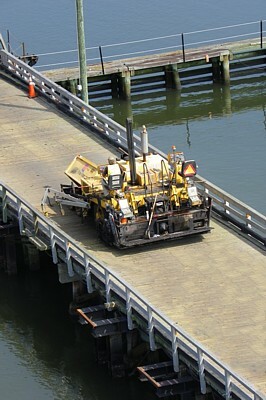 A large piece of paving equipment followed traffic from the island side of the bridge to the mainland. 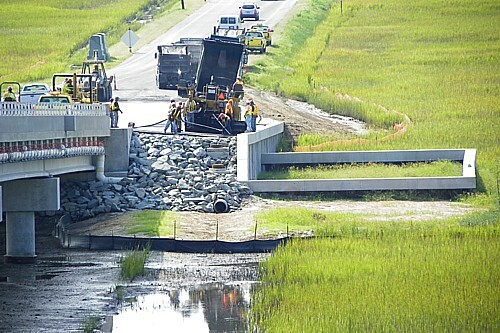 During the weeks after the new bridge opens to traffic, workers will tear down the causeway and work bridge and transport many loads of debris across the old pontoon bridge. 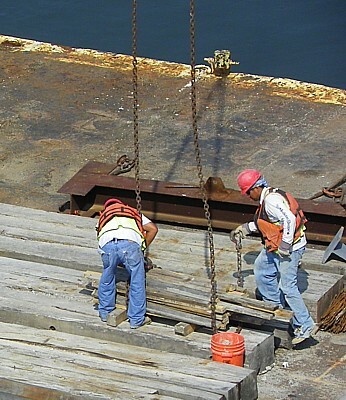 Men working on pavement at the island end of the bridge. The large pipe carrying stormwater run-off is on the left. The first few inches of run-off during rainfall go into the infiltration basin on the right. The contaminants are in the first run-off. 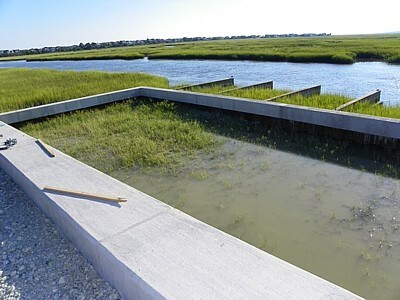 In the event of heavy rainfall, additional run-off, free of sediments, is discharged into the marsh. 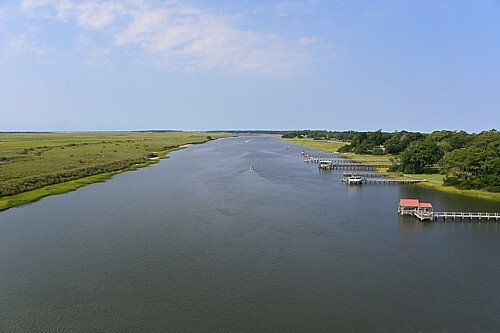 The left forefront of the photo shows an area from which a portion of the old causeway has been removed to allow more marsh to develop. 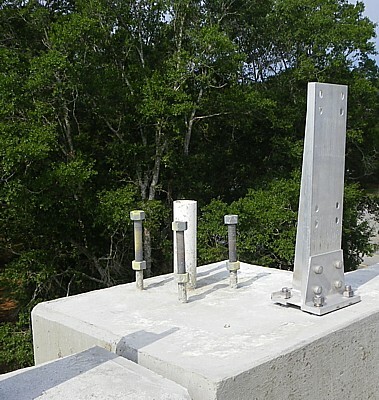 Close-up photos of portion of infiltration basin west of end of actual bridge on island side. Pollutants such as bacteria-laden exhaust, rubber, gas and oil emissions will be filtered out of water in this basin before the water seeps into the Big Narrows. 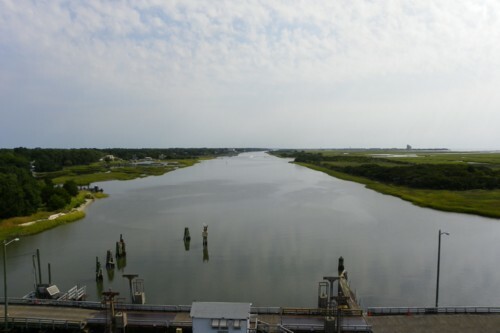 The basin is located on an old fill section that has been in place since the causeway was first built. 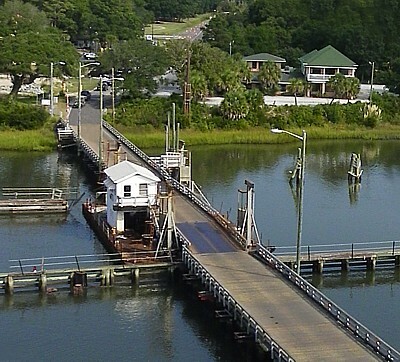 The left photo shows the enormity of the new Sunset Beach Bridge and the relative fragility of the pontoon bridge. 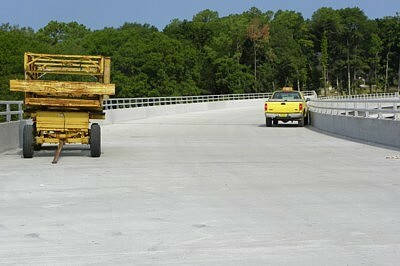 In the background of each photo the mainland ramp of the new bridge, 2,563-feet long, reaches Sunset Boulevard. Orange cones mark the spot. 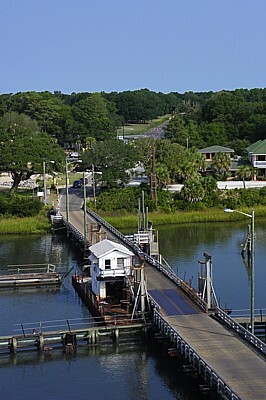 The old bridge, 508-feet long, reaches from traffic signal to traffic signal. The remainder is causeway.